Last week we asked: How did Airdo know that there was this "lot of people in the audience who wanna talk about their experiences with coffee with the mayor” before those people stood up to talk? Could it be that it was all a piece of theater arranged beforehand? If so, how could and why would these people conspire to make such a scene about an internal board decision that was never made public? Because the issue is not insignificant when we remember the history of the coffees—a history Airdo would prefer we forget. When Mike Kelly was elected village president, one of his first orders of business was to establish “Coffee with the Mayor.” It was a simple, informal affair, where residents could come to village hall and sit at a round table with Kelly and discuss whatever they wished to discuss. Kelly’s purpose was to be accessible in an environment more relaxed and inviting than a village board meeting. It was a successful formula he had used for many years as township supervisor on behalf of the people of Hanover Township. Quickly, Kelly’s coffees became well-attended, highly popular events among the residents. And that’s when Airdo became concerned—politically concerned. By then serving in his third, consecutive four-year term as trustee, and harboring a well-known ambition to be village president himself, Airdo declared that it wasn’t right to exclude the trustees from the coffees. Of course, there were two problems with his complaint: 1) trustees were never excluded; and, 2) for more than eight years Airdo sat on the board and never expressed the slightest concern about making himself or his fellow trustees more accessible to the residents at regular, informal meetings. Kelly, in his gentlemanly manner, immediately agreed to change the name to “Coffee with the Mayor & Trustees,” reiterating that all were welcome. After which, Airdo promptly failed to show up at the renamed coffees, over and over again. Fast forward to Airdo’s usurpation of the gavel last November 15, when he and his cronies succeeded in getting Kelly out of the way so that Airdo could be appointed village president. With all the power and glory of the village presidency spooling at his feet, Airdo could finally bring the enhanced stature he so coveted when he met the residents of Bartlett at the next coffee, November 19. He could, but he didn’t. Like all bullies, Airdo cowered when faced with the prospect of being challenged face-to-face, knowing that throngs of angry villagers would be waiting to call out him, Martin, and Shipman for the dirty politics they played just four days earlier. 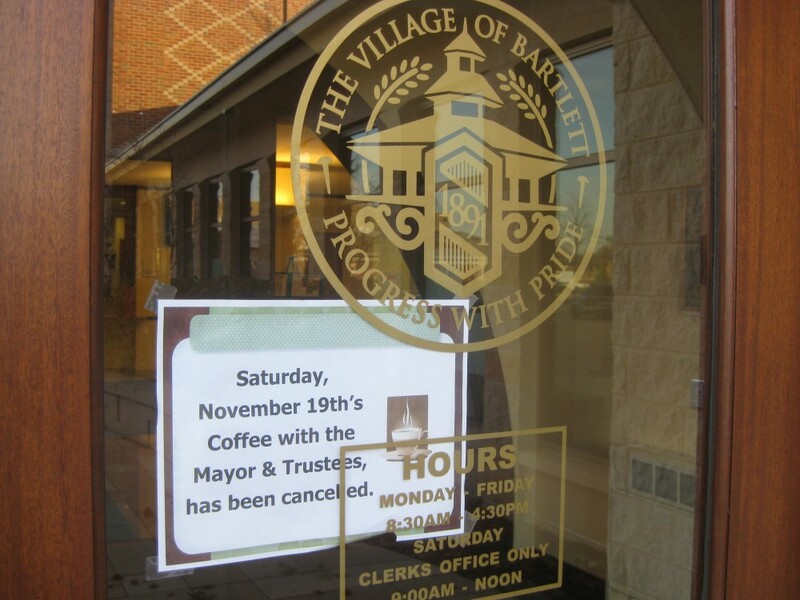 So, they cancelled the coffee, posted a sign on village hall advising people not to come (see photo, left), and went into hiding. Eventually, with questions from the public mounting, Airdo and company had to reinstitute the coffees. Still lacking the courage to face the people as Kelly did before them, though, the bullies instead packed the room with friends and family, took out the round table and chairs, posted themselves in the four corners of the room to disburse and diffuse the crowd, and, most important of all, prevented an intelligible audio recording of the meeting and the preparation of meaningful minutes. Further rebuilding the wall between the village board and the public, the Airdo cabal shoved more of the burden of the meetings onto village employees. Despite the fact that lengthy staff presentations defeat the very purpose of the coffees (interacting with the board), Airdo inexplicably moved to formalize this approach, to set it down in writing in a new agenda, with specific time blocks for such presentations. Which brings us back to the heart of Trustee Arends’s concern and her question. But Airdo would not tolerate being questioned, and so he set up the kabuki theater before the meeting ever started to slap Arends down and send a warning to those tempted to defy him. We might never know that he did so, except that his raging ego betrayed him. So wrapped up in his ill-gotten power, so confident that he can get away with anything, he got careless. He openly told Arends that a lot of people wanted to talk about the coffee agenda before anyone stepped up to talk about the coffee. Putting aside the preposterousness of several people showing up at a village board meeting to talk about a coffee agenda, we have to ask again: How could Airdo know that people showed up to talk about it before they talked about it? Is he a prophet? Or is he just another scheming and petty politician whose hubris perverts his judgment and makes him incapable of shame? We make a motion to proclaim it’s the latter, and we believe, Mr. Airdo, that someone will second this motion. What a shame. What a shame.